In India, education is taken with utmost seriousness. Children are as concerned about their performance as the parents themselves. However, a proper schooling methodology is that which encourages the child to be curious, while having time for themselves and learn with equal measure. It is not necessary that to succeed in life, the child needs to score extremely well. It is enough if the child learns to fend for themselves through their skills. There are stories of businessmen and other stalwarts across various fields who have set an example by paving a path for themselves. While choosing the ideal school, consider this- does the general environment, the location and the practices of the school promote a learning atmosphere? Children need proper nurturing in the form of education, physical activities and mental development. Each child differs from the others – each has a different set of skills and talents. If they are properly nurtured, then the talent and expert skill in each can be easily nourished. Look for good schools across India and ensure that your child is imparted the best education available. The perfect blend of modern amenities mixed with the traditional model of education, such as the ‘Gurukul’, brings about a wonderful structure and content creation in schools. If you child has showcased a special talent, the school should see to it that the talent is exposed and your child expresses it in the best possible way. Out of the best schools, you can find some of the top ten boarding schools in India in the beautiful city of Dehradun. It houses talent, a good faculty and a learning culture. 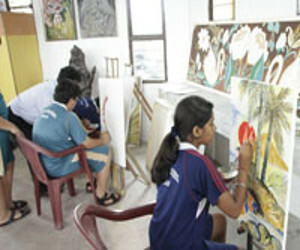 For instance, if your 10- year old has shown an interest in painting, teachers in the top schools are such that they are able to able to give time to focus on her unique talent, enter her in competitions and hire experts for her skill enhancement, if necessary. Chart only those which are known for their great learning culture. A school helps a child discover herself and face the world without the slightest bit of doubt. Each child differs from the others – each has a different set of skills and talents. If they are properly nurtured, then the talent and expert skill in each can be easily nourished. Admitting a child to a boarding school is a tough decision. But with the assurance that the school will take care of the child as much as you would have at home, you can place your trust on the school. Hot and nutritious meals, care and concern by the matron, a disciplined life and facilities for physical development – you child will be happy and content with school life. The most pertinent and rudimentary education your child receives is in schools through various forms – be it through teachers, books, practical evaluations, games, et al. The top boarding schools are amid natural surroundings, in the northern part of India. Nestled near the majestic Himalayas, these boarding schools offer the best environment to the growing child, but nurturing them to realise their full potential. There is no comparison to the health benefits imparted when a student resides in the lap of nature. While scouting schools, you can check the ambience and culture for yourself with your ward. Visit the campus, converse with the faculty, the principal and go through the brochure and achievements of the school.